Vikings linebacker Chad Greenway has continually made an impact on families in the Twin Cities area. Now, he’s asking for your help as the More Than Words campaign is quickly coming to a close. Vikings linebacker Chad Greenway has made it his mission to help the Twin Cities community through his Lead the Way Foundation. As many of you may already know, Vikings Corner, Daily Norseman, VikesFans, Vikings Territory, and Vikings Journal have partnered to launch the More Than Words campaign. All of your donations thus far have helped our websites accumulate nearly $4,000 for the Chad’s Locker program. The donation window will be open until August 22nd and we are hopeful we can still reach our $10,000 goal. 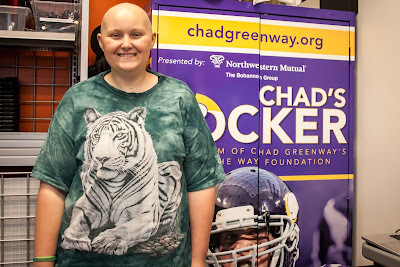 Chad’s Lockers are located in area hospitals and provide patients and their family access to notebook computers, video game systems, movies, and other items to help them feel more at home during extended stays in the hospital. Six of these lockers are located at hospitals throughout the Twin Cities area. I caught up with Chad Greenway after practice to talk about the More Than Words campaign. He continued to echo the type of impact these lockers make not only on the kids, but the families going through this difficult time. Greenway and his wife Jenni, started Lead the Way in 2008, and have continually made it their goal to touch the lives of the people within the Twin Cities community. In eight years, the Greenway’s charitable efforts are estimated to have impacted over 350,000 people. Chad recently went through the same process when his father, Alan, was diagnosed with leukemia. Alan battled the disease for more than two years and Chad was right by his side. He recalls how difficult it was for his family during Alan’s time in the hospital. “I went through that situation with my dad over the last few years and you kind of understand and appreciate how hard that situation is for families and I think it kind of led us to want to do more,” Greenway said. Chad lost his dad in December of 2014 to leukemia. Now, he uses his Alan’s legacy as more motivation to help families who are currently going through difficult situations. “I think when you’re a guy that’s doing charity work or anyone else that is, you understand that it could be you in that situation at any moment. It could be your child, it could be you, it could be your wife,” Greenway said. With the help of your donations, Lead the Way will continue to help children all over the state of Minnesota. 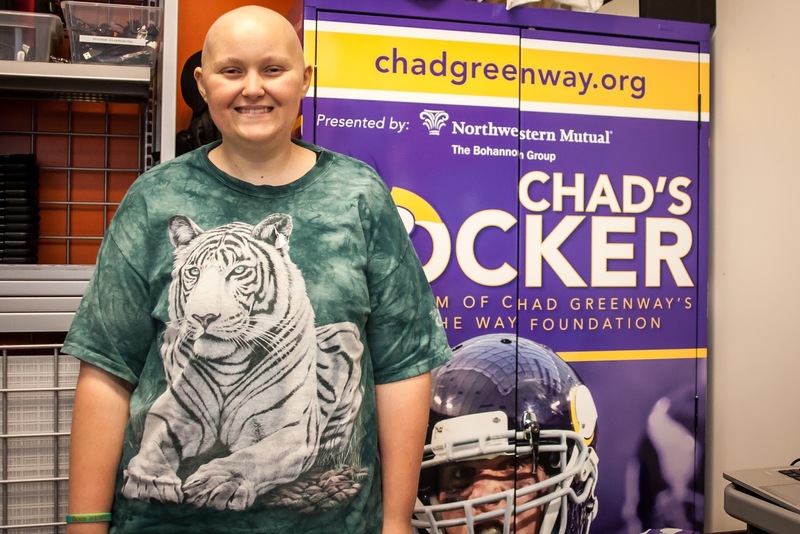 Chad can’t thank everyone enough for their support of the Chad’s Locker program. Your money will help ensure the lockers stay up-to-date and provide the best experience for families. “With the More Than Words social media push, it’s about funding our lockers, and continuing to add new things. We try to update our lockers quarterly to keep the stuff fresh and More Than Words is helping with that. We are certainly grateful for the five different sites that are helping us out. Those five sites have been unbelievable and I think with any charitable giving it’s about awareness and it’s certainly helped push that,” Greenway explained. These lockers are having a first-hand impact on families who are utilizing this resource. It cannot be reiterated enough how much Chad Greenway cares about others. He takes time out of his busy schedule to help people each and every day. Now, it’s time to support Chad as he continues to impact families across Minnesota. Any type of donation would be greatly appreciated to help us reach our goal. Please spread the word to all of your family, friends, and co-workers. The More Than Words donation window will be open until August 22nd. You will be taken through the payment process and once you fill out the necessary information, you will be allowed to select which Vikings website you would like to dedicate your donation to. Let’s all come together and help Chad Greenway make his vision a reality!